I did three things with the puff pastry I made. Mushroom potato turnovers (vegan), caramelized onion tart (vegan) and tomato and cheese tart for my daughter (non-vegan). 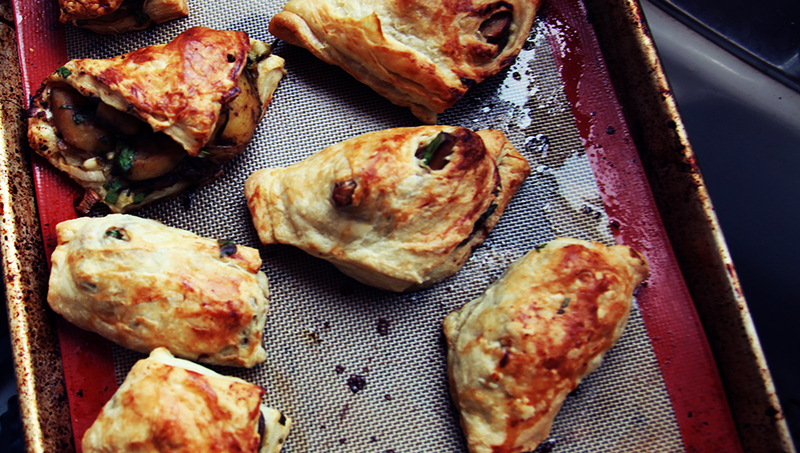 The mushroom and potato turnovers were probably the best, flavor-wise. Essential to the flavor was fresh green onions and fresh parsley. The sharpness of those herbs balanced against the richness of the potato mixture. Unfortunately I did not write down the recipe nor did I take any photos of the cooking process. I think it is really a recipe you can improvise, depending on what flavors you prefer. The key to the recipe is keeping the potatoes at the right level of firmness – they can be too soft but should never be too hard. Also build the richness by cooking with mushrooms – dried and fresh – along with red wine, garlic and onion. A bunch of yukon gold potatoes (or any kind of potato) boiled to firm softness. You can stick a knife in them but they aren’t crumbly. Basically I wanted to cook down the mushrooms to concentrate the flavor as much as possible. Once the mushrooms are cooked, slice the potatoes to about a 1/4 inch thickness, then cut slices in half. Add that to the mushroom mixture. Let that gently simmer for a bit, then pour in some wine. Add the bouillon and some water to go with it, maybe 1 cup. Simmer for a while. Next, add a tablespoon of herbs de provence, some salt and pepper and simmer. Then, when it looks kind of thick and yummy, turn off heat and add scallions and parsley. Now it’s ready to fill in the puff pastry. I’m fairly sure that’s all I used for the filling, which was ultimately so delicious I could kick myself for not writing down the recipe. The trick with most of the vegan cooking I’ve been doing is to add layers of flavor. That means you can’t shortcut with meat or dairy to deepen flavor. Cooking the mushrooms themselves was one rich layer. Adding the soaking liquid from reconstituting the dried mushrooms. Adding the bouillon, another layer. The wine. Herbs dried, then herbs fresh. Each layer adds necessary richness. Mushrooms, in this case, add the needed umami. The potatoes themselves have SOME flavor but really they’re there to soak UP the flavor. Building the meat pies ain’t easy. But the good thing about puff pastry is that it tastes good no matter you twist, distort or misshape it. Is it better if it looks pretty? Yes it is. Does it make much of a difference taste wise? Not really. Just shove it in there and close the package as best you can using whatever method you prefer – fork the edges, seal them with a butter knife — it doesn’t really hurt it. Then you need some kind of “egg” wash if you feel like making them extra golden brown. Bake until golden brown and bubbly. Yum! They can be stored best out of the fridge or frozen for longer term storage. NOTE: you can do with these anything you want, from making these turnovers to making a tart to making little appetizers. It’s a very flexible recipe and would only depend on how big of potato slices you made.